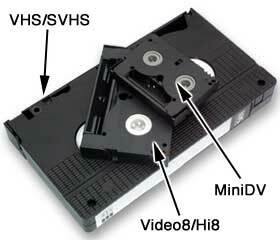 VHS is the world's most widely used system for recording and viewing video tapes at home. There are over six hundred million VHS recorders in use world wide. VHS technology was developed by Matsushita (Panasonic/JVC) in Japan in the mid nineteen seventies and is still the most popular home system worldwide. Most transfer jobs include VHS copies, it is however a poor choice to use as the original copy as it are the lowest quality format. VHS video tapes carry the same signal that an average home tv set can show (240 lines of video). The original VHS looks good on television but copies made from the VHS original degrade from generation to generation. It is best to use one of the new digital formats for a master copy such as MiniDV or Digital8 which carry a signal of 525 lines, and at a higher bandwidth, so color and detail are improved, Our system is digital from end to end to fully exploit these new digital video tape formats. You can then get VHS copies that are as good as VHS originals would be, even if you do not have a digital camcorder or player. I just want to thank you for restoring my old films. They came out great-especially considering their condition! I also appreciate the refund of the extra money that I had sent. I plan to send you another batch of films by fall.